Published May 26, 2017 By Anna T. This post may contain affiliate links. Regardless, I only recommend sites I've researched and/or used and trust. In recent years, website and software designers have begun to rely on freelance workers to do a lot of their website testing, and several companies have risen up to help them fill that need. These companies generally hire ordinary people with no particular training, and the work is fairly easy. Some of the companies in this category are primarily focused on bug testing, but most are more interested in getting feedback from regular users on the quality of various interface designs. The work generally involves going through a website or trying out a piece of software while providing real time feedback about your experience. Afterward you may have to answer a questionnaire. One issue with this kind of work is that it’s definitely not full time, at least not in most cases. Some of the services do pay quite well in terms of the level of compensation in comparison to the time you spend on a given job, but since most tests only take about 20 minutes to perform, that still doesn’t add up to a whole lot. A good strategy is to sign up with several different services at once to maximize your testing opportunities. It isn’t unusual for companies to provide anywhere from four to eight jobs in a given month, and that can add up if you are working for enough of them. Below is a list of some of the better known services that make it possible to test websites for money, along with a little bit of information about each. This company uses software to record the actions of your mouse cursor on your computer screen while also recording your voice through a microphone. They pay 10 dollars per website test, but they also offer tests for mobile devices, and will pay up to 15 dollars for those. Pay is via Paypal. Read our UserTesting review for more details. Enroll lets you take quick tests to help make the web a better place for everyone. Help companies decide which logo is better, clarify content or simply complete tasks on a web site or app to ensure the interaction makes sense. Anyone can do it! You are paid every month via Paypal as long as you have at least one dollar earned. You can check out our Enroll review for more details. This site will pay you for testing new sites, apps, and gadgets. Up to $10. Open worldwide. Eli Bird requires that you are at least 18 years old and a native English speaker in order to get paid for tests. You can expect your pay via Paypal approximately seven days after you complete tests (per the website). Check out our review of Erli Bird for more details. This company is primarily involved in beta and alpha testing new software. You’ll be looking for bugs and reporting them. The pay is potentially quite good compared to other jobs in this category—some people claim to make well over 1000 dollars a month—but you’ll need some degree of technical savvy if you want to get into that range. They rank their testers based on quality of performance, and the higher ranked people get better pay and better job opportunities. Another software testing company focused almost exclusively on searching for bugs. Most jobs only pay if you manage to find a bug that hasn’t already been found by another user, and this practice introduces a competitive element where workers are racing to see who can find the bugs first. Pay varies significantly from job to job. Be sure to check out our MyCrowd review for more details on how it works. To do website testing for IntelliZoom, you'll need a desktop, tablet or smartphone, a reliable connection to Wi-Fi, a quiet place, and the ability to download UserZoom’s eCertified testing software. The pay will vary between $5 and $10 per study, for 10-20 minutes of your time. Payment can take 21 days to receive, paid out via Paypal. Earn money for testing out Intuit's software. They claim to pay as much as $100 per hour for your feedback on their products such as TurboTax, QuickBooks, and their ProConnect products like ProSeries, Lacerte, etc. This company monitors your computer screen via screencast software to see what you are doing with your mouse. Meanwhile, you follow their instructions, and describe your experience aloud into a microphone or headset. Afterward you have to answer a questionnaire. To get hired you’ll have to do a free sample usability session, and each test goes through an approval process before they make your money available. Payments are processed through Paypal. This company will pay you up to $50 for rating apps and finding bugs. The more devices you have to find bugs on, the more invitations you will likely receive to test. They pay once monthly using Paypal, Skrill, or Payoneer. It appears this company may be open worldwide. The tasks you’ll be required to perform vary a lot, including everything from simply browsing a website with no particular goal in mind, to making comparisons between multiple sites. During each test, you’re expected to talk very freely and describe everything about the experience you’re having with as little shyness as possible. Pay is via Paypal, and is generally 10 dollars per test, but some of the more difficult tests pay better. Read our Userlytics review for more information. A company based out of the UK. They record your screen as you browse sites, and like most other sites, they expect you to provide a vocal description of your experience. Pay is 8 dollars a test via Paypal, and you are required to do a free test as an application. Be sure to check out our What Users Do review for more details on how it works. This is a UK-based company, but they claim to allow people from all over the world to complete tests. Pay is £8 per completed test (works out to about USD $10.50). You have to do a sample test prior to being accepted as a panel member. Also, all tests are not paid because the companies submitting the tests do not have to attach a cash reward to their jobs. However, you are not required to accept any tests that you don't want to accept. 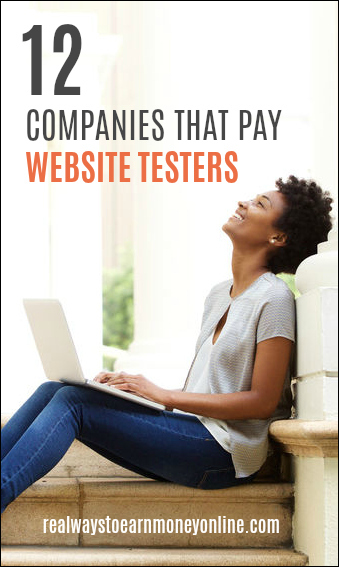 And that wraps up our list of companies that pay for website testing from home! Good luck to you, and please feel free to comment below sharing your experiences with any of the above companies. This is a bonus mention! PlaytestCloud pays you for playing mobile and browser-based games. Like the sites listed above, you're asked to voice your thoughts aloud as you play so that game developers can listen and benefit from your feedback to make their games better and better. Tests pay $9 for 15 to 30 minutes of your time. Be sure to read our PlaytestCloud review and learn more about how it works. This post originally published in June of 2012. Updated and re-published May 2017.